The dental surgeries of Dr. Gogushev are situated in the town of Varna all the year round, and in the Mimoza Hotel in the Golden sands resort from 15 April to 15 October. Manager of the surgeries is Dr. Georgi Gogushev. The activity of the surgeries includes prevention, diagnostics and treatment of the illnesses of teeth, mucous membrane and oral cavity. 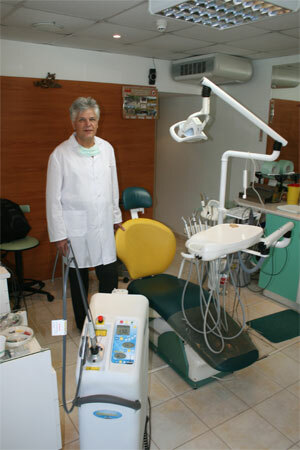 The surgeries dispose of modern dental equipment which includes dental units – "media", intraoral camera for diagnostics of dental diseases, X-ray apparatus (camera) for instant images - "Kodak 5000", hi – energy laser – "WaterLase", low – energy laser – "Six-Laser", equipment for ultrasound cleaning of tartar. In our surgeries we offer treatment of caries and its complications, tooth extraction, orthopaedics, orthodontia, treatment of children's teeth, cleaning of tartar, treatment of paradontosis, X-ray images, as well as specialized services like fitting of implants, whitening of teeth, sealing of fissures. At patient's request there is a possibility for use of "deep sedation" – a kind of complete sedation, at which during the whole manipulation the patient doesn't feel and doesn't remember anything.